More and more, homeowners are turning to helical tiebacks for help with foundation repair. Helical tiebacks are a common product used to reinforce walls both indoors and out. They can be used to stabilize retaining walls or correct bowing walls in a basement. When a basement wall leans or bows, it can create a lot of problems for the home. The more pressure that is put on the wall, the more it bows. This means that, unless it is fixed, these walls will only get worse and could possibly collapse. Bowing walls are often accompanied by problems such as cracks and sticking doors, meaning that these problems are serious enough to warrant some professional help. Helical tiebacks can also be used for extra support in retaining walls. If there is a lot of moisture in the soil around your home, helical tiebacks might be the best option for your retaining wall. What is a Helical Tieback Anchor? Helical tiebacks are long metal rods inserted into the soil to help evenly distribute the pressure caused by heavy soil. When the soil around your basement walls gets too much moisture trapped in it, it expands and pushes the foundation walls in your home, often causing a leaning or bowing wall and wall cracks. To correct these, United Structural Systems installs helical tiebacks. Helical tiebacks are used both to distribute pressure and to return walls to their original, upright condition. When are Helical Tiebacks Used? What are the Benefits of Tieback Anchors? When the professionals at United Structural Systems install helical tiebacks, your walls will be stabilized and strengthened, keeping your home safe. Whether you have a retaining wall in need of extra support or you have bowing walls that need some reinforcement, contact United Structural Systems today about helical tiebacks. When installed by a professional, experienced contractor, helical tiebacks can save your home from soil pressure and possibly keep your walls from collapsing. For more information, contact United Structural Systems. We are your helical tieback service providers in Illinois. We also have many other underpinning solutions such as helical piers, steel push piers, and plate anchors. 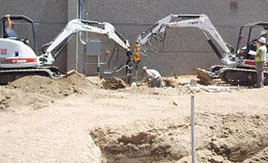 We can evaluate your specific residential or commercial foundation failure problem and find the right solution for you. So watch for the signs of foundation sinking and settlement and then call the Chicagoland area and Suburbs foundation professionals today.